Here’s a list of notable books I read or listened to in 2012. I suspected that I read more than the average person, then I googled it. The Bureau of Labor Statistics (Seriously? An entire bureau for this?!?) reported that in 2011, the average man spent 2-3 hours a day watching TV and 15-20 minutes reading for pleasure. To all those people spending 2-3 hours a day zoning out to TV, I can tell you unequivocally there are entertaining things available in written form only. I hope you’re using your 15 minutes reading my blog. I read the paper most days. I read real, paper books and I read on my tablet. In July, I handed down my 10-inch Archos table to Tre and upgraded to a Nexus 7. It’s good for reading in bed or on the couch. I read blogs and I read epub books. (If you’d like a few suggestions, connect to me on Ownshelf.com. All the books on my shelf are free to share.) I alternate between listening to my favorite podcasts and books when I’m riding BART or walking to the gym. I’m usually most interested in non-fiction. The idea that I’m learning something useful is a spice sprinkled over the meal of the book. Contrast this to my friend Ron’s assertion that the exclamation mark is the spice of life. The spice of writing is probably more precise. Ron likes his emails spicy!!!!! Anyway–after reading a particularly heavy non-fiction book about mental health, I read a bunch of fiction for a change. Tre was still making his way through the Harry Potter books and I decided to read the first one while we were on Vacation in Cancun. Then I read all of them. Going on about them is superfluous. They are good. They reminded me of being about 12 and reading the Xanth books. So, I started re-reading those. No, I haven’t re-read them all. First of all, there are more than 30. Second, I stopped reading them around #19. Piers Anthony has been writing a new Xanth novel a year for more than thirty years! I found it interesting to compare the first two books from the two series. In both, the first book is perhaps a little out of sync. The general style is set, but there are small imperfections that later books would have polished out. Although I wish I had the Harry Potter books to read when I was little, I’m happy to find that the Xanth books are as good as I remember. All these years later, I appreciate the aspects of romance and fatherhood in a way my child self could not. All that is to say I expected my list of books to be shorter than last year because I read some non-new, popular fiction. I also listened to a version of Catcher in the Rye recorded for the blind. The voice actor was great. I was expecting it to be more dramatic. Mostly what I took away from it was the narrator’s way of turning a phrase. I really did. I’m not kidding. This is the super-heavy book by Robert Whitaker about mental health that I read early in the year. This is exactly the type of non-fiction book I enjoy: someone uses the power of government to extract wealth at the expense of innocent people. For an example, see Taube’s Good Calories, Bad Calories. When Taube shows how chief idiot George McGovern leads a committee of idiots to institute a new dogma of low fat for heart health, I was keenly aware of the tragic consequences. Countless people continue to be harmed by this careless decision. It was not lost on my that my own father was harmed by it. But Whitaker’s story is at least twice as tragic. First because the suffering of the mentally ill, mild or severe, likely outstrips that pain of heart disease or obesity. Second because too often, the treatment that’s worse than the disease is inflicted by parents upon their children. Some of well meaning and mislead by the doctors they trust. Some are lazy and ought to know better. Perhaps some are too mentally ill themselves to do anything better. In each case, it breaks my heart. I am interested in improving mental health, and I’ve been working on a semi-stealth startup that will offer software to help therapists provide better service. After reading this book, I felt some fear that the APA would be threatened by software that helps prove that non-pharmaceutical treatment is effective. I discovered Whitaker from an interview with Stefan Molyneux. I have his earlier book Mad in America on my shelf, but I couldn’t take reading it yet. 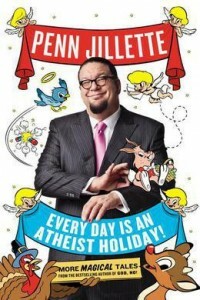 I got Penn’s new book for xmas and read through most of it that day. Like his book from 2011, this book is a yummy cake of personal stories frosted with some philosophical perspective. I have enjoyed listening to Penn’s Sunday School in between listening to books or other podcasts. No other podcast makes me laugh out loud, which may be disconcerting my fellow BART riders. Because I lack much of an older, guiding generation in my life, I look for that experience from public sources. It’s not the same as asking advice from my father, but it gives me comfort knowing there are guys out there that think the way I do and have been doing it longer than me. My list of role models includes Henry Rollins, Leonard Peikoff, Nathaniel Brandon, Richard Nikoley, Eric Raymond, Stefan Molyneux and Penn Jillette. The most interesting part of this book is about the conscious choice to put most of your energy into being a great dad. In the middle of life, we can see that the higher peaks of our careers are not worth climbing. There is an overwhelming emotion that comes with being a dad who’s present in the moment, who’s enjoying the lives of his wife and children. Molyneux can be heard saying that this is how we change the world, by being better parents. I accept that. And reading Penn talk about his kids made me love my kids even more. It inspires me to do even better as a dad. This post has gone on far longer than I expected, so I’ll just list a few other books I enjoyed this year. Most of them aren’t new, except to me. Body by Science: A Research Based Program to Get the Results You Want in 12 Minutes a Week by John Little, Doug McGuff offers a brief overview of a method for strength training that I’ve been following for the past six months. God Is Not Great: How Religion Poisons Everything by Christopher Hitchens is a classic by the late author. Mustaine: A Heavy Metal Memoir by Dave Mustaine and Joe Layden tells Mustaine’s side of the Metallica story as well as all of his adventures with Megadeth. Confessions of a Conjuror by Derren Brown is more biographical than his previous book, Tricks of the Mind. I like everything Derren does and wish I didn’t have to go to the UK, physically or via the Internet, to see him. How the Mind Works by Steven Pinker is another classic that I just recently caught up with. The Drunkard’s Walk: How Randomness Rules Our Lives by Leonard Mlodinow was a good reminder how many things in our lives are simply random and part of no pattern. Nature Via Nurture: Genes, Experience, and What Makes Us Human by Matt Ridley talks about epigenetics long before it became a popular subject. Letter to a Christian Nation by Sam Harris and Jordan Bridges is one of several Sam Harris books I read or listened to. His Free Will book is on my list despite my general distrust of anyone who argues against free will. The Religion Virus: Why We Believe in God: An Evolutionist Explains Religion’s Incredible Hold on Humanity by Craig A. James argues that religion is an idea virus that has evolved to perpetuate itself. Boardwalk Empire: The Birth, High Times, and Corruption of Atlantic City by Nelson Johnson and Terence Winter covers the real history of Atlantic City. It’s a good contrast to the show. The Yugo: The Rise and Fall of the Worst Car in History by Jason Vuic traces the history of how the Yugo ever made it to America. Against the Gods by Stefan Molyneux covers all the arguments against the idea of there being supernatural beings.